First data on major, minor and trace element (XRF. 1CP-MS) concentrations in the volcanic rocks of the IVS 50th anniversary Fissure Tolbachik eruption are reported for the period from 27.11.2012 to 25.01.2013; scheme of lava flows distribution by March 2013 is made. 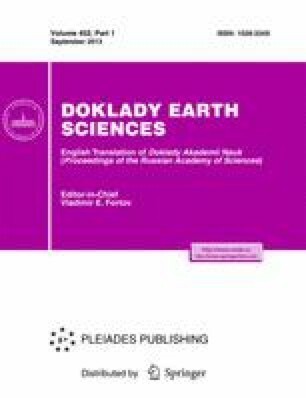 The volcanic rocks of the new eruption are substantially different from the other studied volcanic rocks of Tolbachinsky Dol by their higher alkalis and incompatible elements content. The rocks of the first three days of eruption (Menyailov Vent) have higher silica and alkalis content than all previously reported volcanic rocks of Tolbachinsky Dol. Volcanic rocks of the Naboko Vent, at silica content similar to high-Al basalts of Tolbachinsky Dol, have different concentrations of trace elements and some major elements (K2O, CaO, TiO2, P2O5). REE and other incompatible element concentrations in the rocks of the Menyailov Vent are higher than in the rocks of the Naboko Vent at the same element ratios. The differences of the volcanic rocks of the two vents of the new eruption may be caused by the fact that the erupted lavas came from the different levels of the same magma chamber. Original Russian Text © A.O. Volynets, D.V. Melnikov, A.I. Yakushev, 2013, published in Doklady Akademii Nauk, 2013, Vol. 452, No. 3, pp. 303–308. The article was translated by the author.